Kudritz, Hungary - Welcome to Kudritz! Kudritz was a small town in the southern area of Hungary known as the Banat region. This area was heavily populated with people of German descent who came to the Banat during three phases of government-sponsored colonization in the 18th century. Kudritz was also known by the Hungarian name "Temes Kutas". 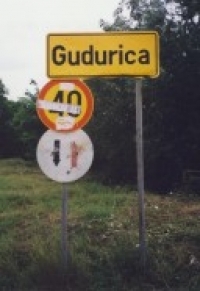 Today Kudritz is known as Gudurica, Serbia. This site is dedicated to preserving historical and genealogical information from Kudritz, as well as supporting and preserving our heritage within the town. May 2015 UPDATE: All church records have been uploaded and are available to supporting members. If you have made a donation to get access and can't get to them please contact me and I'll make sure you find what you need. A note to thank Stasa Cvetkovic (www.synergia.rs) for helping with a recent inquiry about Father Miklos Kahle. You can read more about Father Kahle in the Photos and Documents page.